This is a Pyrethroid Insecticide using ??? as the active ingredient. It is a residual insecticide which means ???? (it kills the insect on contact and then it stays coated on the leaves to kill new insects coming on to the leaf for up to ___ weeks. It is a liquid concentrate which means you will mix it with water to use it. It mixes instantly in water. You want to spray on the top and the bottom of all the leaves if possible. This is a special formula for difficult-to-control insects such as birch leaf miner, flat and round headed borers, peach tree borers, bark and wood boring beetles, whit pine weevil, taxus and strawberry root weevil. 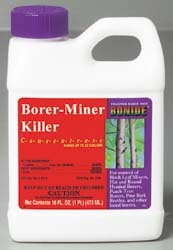 Recommended for use on fruit trees, shade trees and ornamentals. It can be used up to ___ days before picking fruit.